Controlling the intensity and flavor of your coffee is easy with a French press coffee pot, so it's not surprising that coffee aficionados the world over often prefer a French press to other coffee-making methods. 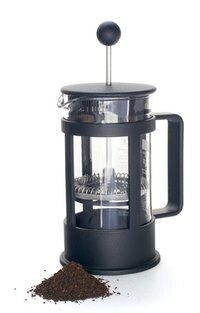 An important component of making the perfect cup of French press coffee is water temperature. If the water is too hot, the coffee can taste bitter. If it's too cold, the flavor will be less intense and may taste slightly "off." Luckily, water temperature is easily monitored. Bring your water to a rolling boil in your kettle. Fante's Kitchen Wares Shop recommends using 4 oz. of water for every 1 tablespoon of coffee. A standard-size cup holds 8 oz. Adjust the water volume up or down according to your needs. Stovetop or electric kettles yield the same end results, but electric kettles are faster and arguably more convenient. Turn the heat off. Water boils at 212 degrees F, unless you live in a high-altitude area. If you live in the Rocky Mountains or somewhere else with a high altitude, water will boil slightly below 212 degrees F because of the lower atmospheric pressure. Use your thermometer to gauge the temperature of the hot water. When the temperature reads between 195 and 205 degrees F, pour the desired amount of water over the coffee in your French press. Brew your coffee according to your preference. If you wish to make more coffee with any water still in your kettle, you will need to repeat the heating process because any water remaining in the kettle is no longer hot enough to properly brew your coffee. Since temperature is crucial in coffee enjoyment, try rinsing your French press with extremely hot water before adding coffee and pouring boiling water in. This will heat the press, allowing the unit to stay hotter longer as it brews your coffee. Swirling hot water in your coffee cup can help do the same thing. Boiling water in your microwave oven should be approached with extreme caution. Due to the way microwaves heat water, a phenomenon known as "superheating" can occur. Superheated water is actually hotter than boiling but does not have the telltale bubbles of boiling water until it is agitated. The U.S. Food and Drug Administration (FDA) advises reading your manufacturer's microwave instruction manual to determine the best heating time for your water. FDA also advises taking care to not heat your water excessively.